Orlando Pirates: Benni aka Promises. A newly signed Orlando Pirates striker Benedict Saul “Benni” McCarthy (born November 12, 1977) told the media that he will score more than 20 goals in this very season. Does he still have what it takes to shake the football fraternity? He made only three starts and failed to score any goal for his former team West Harm. And later on his contract was terminated by mutual agreement. The big question remains, is he really the old Benni who was the top scorer in the 1998 African cup of nations in Burkina Faso? Is he still the goal scoring machine that inspired many? The Kwaito group TKZEE even composed a song about him before the 1998 world cup where he was featured. 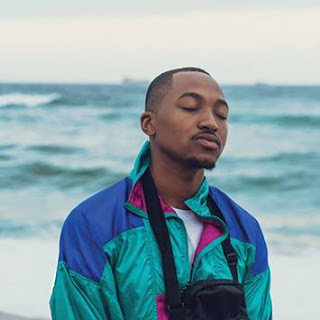 The “Benni in the area” song made him more popular and his performance was out of this world. McCarthy was also featured in the 2002 world cup. 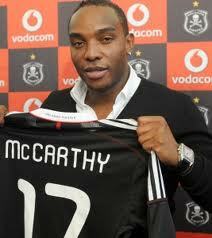 He is currently wearing his famous jersey number 17 in the buccaneer’s family. Though he scored a goal in his first derby, but some fans think he hasn’t done much in the field of play. The goal he scored would have been scored even by a Grandmother. 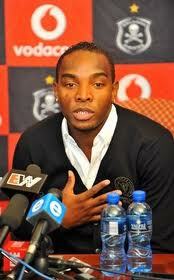 During the announcement of his new home Benni told the nation that its payback time, therefore let’s wait and see. If he’s score more than 26 goals he’s got a car coming on his way to add on his Bentley car estimated to be costing 1.5 million. After all he has to deliver regardless of the rewards from the sponsors considering what Pirates put on the table for him. His Salary is estimated to be R250.000 a month. He has signed a two year contract with the Bucs team. Hopefully he works hard at training to avoid gaining weight that led to him being eliminated in the final selection of the Bafana Bafana squad during the world cup. All eyes are on him; will he survive? Of course that will be determined by the grace of his boots and the ability to perform like any ordinary player. He has competitors for the goal leading award like Bernard Parker and Lehlohonolo Majoro from Kaizer Chiefs, Katlego Mphela of Mamelodi Sundows and other young players. Above all he needs to be welcomed and feel at home because there’s no place like home. 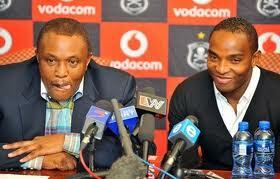 Smiles: Team Boss Irvin Khoza's faith is with Benni McCarthy. Speaking to Sport24 he said, “Fitness-wise I’m fine; it is a work in progress. I want to reward Pirates for their confidence in me by scoring goals to help the club do well in the PSL and African Champions League. I also want to thank the supporters and promise them we will make them happy by winning trophies.” Now the rest lies on Benni himself to prove many people who have speculated otherwise that he can and will conquer. Let’s see if his forever smile can charm goals behind the net.